The French for suspend is the regular -RE verb suspendre. To remember this, imagine you are SUSPENDED from the ceiling! suspendre can also mean: to hang up; to adjourn. - se suspendre (vr) : to hang. 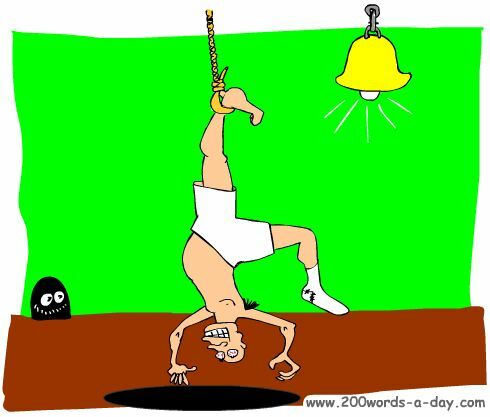 - en suspense (advj) : hanging in the air, suspended, dangling. - suspend/e à/par (adj/pp) : hanging (from/by). Most verbs ending in -dre are conjugated in this way such as : confondre, détendre, entendre, étendre, fendre, pendre, prétendre, tendre, tondre, suspendre. Exception: prendre (to take) and its compounds. Learn French with Cartoon Memory Triggers. To remember a word, think of the pic! Imagine you are SUSPENDED from the ceiling! suspend! suspends ! suspendons ! suspendez ! ✔ suspendre is a regular RE verb. ✔ Learn suspendre and it will reinforce the pattern for ALL those other regular RE verbs. ✔ You can more easily remember words and verbs like the French verb suspendre - French for suspend - using the techniques of the world's Memory Masters. 200 Words a Day! Free Daily French Lesson Online - the French verb suspendre- French for suspend - fully conjugated. French Learning Made Fun and Fast with your free Daily French Verb Lesson - suspendre.